If you are missing a tooth or are looking for a way to replace multiple missing teeth, Colorado Springs implant dentist, Dr. Matthew Burton offers dental implants. Dental implants are an excellent alternative to dentures; they are a stable, fixed solution for a full missing arch. Implants can also provide excellent stability and support for certain dental appliances such as implant-supported dentures. Dental implants are artificial roots (usually titanium) that are surgically placed into jaw bone by a dentist. 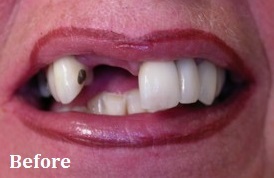 The restorations attached to the implants are very natural looking and match your existing teeth. 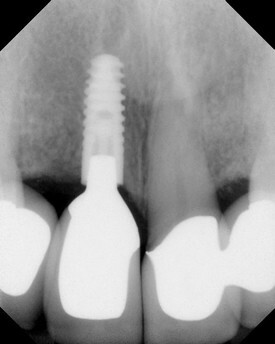 Implants last many years and are a solution that often enhances or restores a patient's smile. Our Colorado Springs dental implants are very strong, stable, and durable when taken care of properly, but on occasion, they may have to be tightened or replaced due to normal wear. Dr. Burton utilizes advanced technology to conduct his surgeries. He has invested in Straumann coDiagnostiX ™, and implemented this cutting-edge implant system into his process. Straumann coDiagnostiX ™ is computer-guided implant surgery and leads to more accurate implant placement and a shorter post-surgery recovery period than traditional implant placement. By using this system, it turns a complicated process into something that is simpler and less traumatic than extracting a tooth. The process of getting implants requires a number of visits over several months. If you are interested in Colorado Springs dental implants, you can schedule a consultation with Dr. Matthew Burton. If you decide implants are the best solution for you, we will arrange a second appointment. At this appointment, Dr. Burton will take impressions, evaluate bone mass, and then send the impressions to the lab at Straumann. If the patient does not have enough bone mass to place the implant, bone grafting must be done and allowed to heal before the implant can be placed. Once impressions are received, the lab constructs a three-dimensional X-ray and then creates the computer-guided surgery surgical template from the impressions and X-ray. This surgical template plan is sent to the doctor and contains guides showing exactly where to position the surgical instruments and place the implant. The actual placement of the implant is a minimally invasive procedure. Most patients only require local anesthetic for the implant placement; however, we also offer oral medication or nitrous oxide for those with dental anxiety. We also work with an outside nurse anesthetist and will bring them in to provide IV sedation if requested. After the placement of the dental implant, we allow three to four months for the implant to fuse with the jawbone. Once this time period has passed, we will take additional impressions and create the dental restoration. The artificial teeth are then securely attached to the implant, providing excellent stability and comfort to the patient. If you have any questions regarding our Colorado Springs dental implants or our computer-guided implant surgery, please contact our office for more information.